Happy Eve of All Hallows’ Eve! | Oh, the Places We See . . . Happy Eve of All Hallows’ Eve! Driving down Hwy. 11W headed to Knoxville from our visit to Cumberland Gap, Tennessee — Bert driving, me staring at the landscape, poised to find great East Tennessee barns — something caught my eye. Not a barn. Not a beautiful country house. Not a farm. Something creepy, seen in a flash. Wish you could have told me earlier, he said as I grabbed the telephoto hoping for a shot. Yeah, but I just saw this. 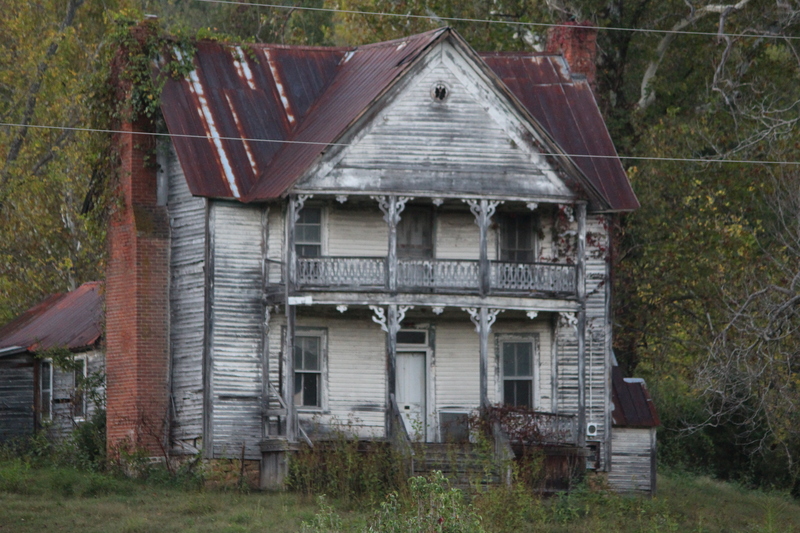 Not sure, but this may be the spookiest house we’ve ever seen, I explained in my best apologetic voice. So on this eve of All Hallows’ Eve, we give you a look at one chillin’ place on Hwy. 11W, unretouched. And shot no closer than this. I sure wasn’t going to the door to ask permission! This entry was posted in Travel and tagged scary house, spook house, spooky. Bookmark the permalink. 14 Responses to Happy Eve of All Hallows’ Eve! Now that is a super spooky house. YIKES> Happy Halloween to you. Sorry to be so late getting back to you, Ruth. How nice of you to wish us well on a holiday I enjoy. But this house, not so much! Bert and my husband, Steve, could swap stories about driving around a photographer. Does Bert understand the simple statement “Wow, that would make a great shot” means stop or do you, like me, have to actually use the word “stop”? Love abandoned houses. I’ve been known to sneak into one or two. Always neat to see what’s been left behind. You’re so right, Sue. I knew I had to have a photo of this one! Thanks for your comment. I was so glad I could stay in that church parking lot and shoot from there. I’m not so brave when it comes to going close to strange homes! now that’s spoooookkkyyyy….so glad Bert is willing to do the turn-arounds! I’ll have to say, in the last few years while we’ve traveled and I’ve enjoyed taking pics, he’s done a lot of turn-arounds! And moving forward, backward. And moving closer. It goes on and on!